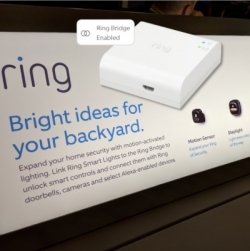 Ring Smart Lighting system launches at CES 2019 one year after the acquisition of Mr. Beams, maker of quasi-connected outdoor lighting products that Ring is IoT-enabling. Why the proprietary RF and bridge? Hi Julie! I also found this one of the more interesting product announcements at CES! It makes a lot of sense, since both product lines base their appeal on not requiring any wiring, compared to the traditional products they replace. The low-frequency radio helps with range outdoors, so it’s not a bad choice. As the companies integrate the products further, there are a lot of intriguing possibilities to expand features and functionality outside of the home. I hope we’ll see interesting things in the future- especially now that Mr. Beams and Ring are now part of Amazon!